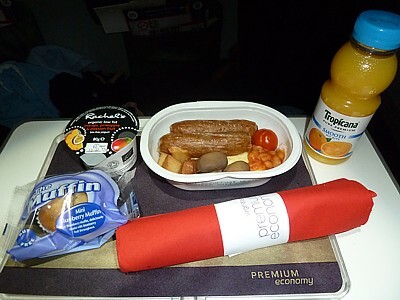 Virgin Atlantic's food policy is a bit weird: its seems to be random what you get. Sometimes its good, and sometimes terrible. 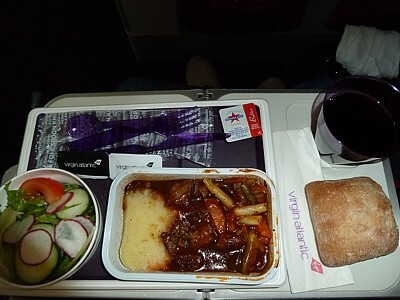 Virgin has even generated news coverage from something as simple as the worse airline meal ever to generate a complaint letter. 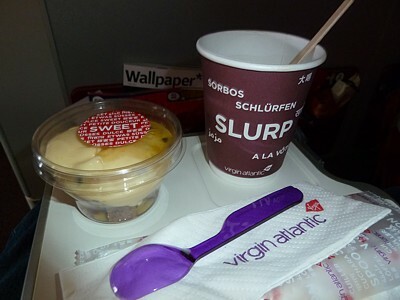 At least Virgin do offer a choice (of two) meals, so there is some variety. 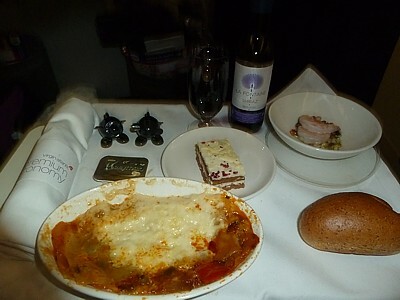 On a transatlantic flight you'll get two meals. 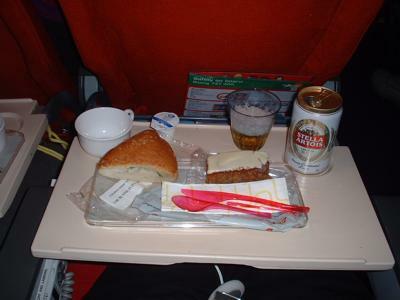 A full try an hour after takeoff, and a second, lighter, snack an hour before you land. 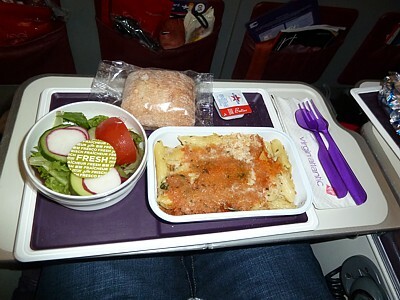 Virgin Atlantic Premium Economy food is identically to that served in plain economy, but is served first, and the main dish comes in china not plastic, and there are real metal knives and forks, a proper cloth napkin, and a plastic version of the famous Virgin Atlantic Salt and Pepper set, called Wilbur & Orville. There is one other slight difference: the wine comes in 35cl bottles, rather than out of a large bottle in economy. Vegetable Lasagna with ratatouille and shaved Italian Cheese. King Prawn starter with a mixed bean salad in a citrus dressing. Belgian white chocolate cake with raspberries. Fulled cooked English breakfast with omelette, sausage, diced potato, mushroom, tomato and baked beans. Pan-fried pork sausage with onion gravy, green peas, carrot and parsnip, and mashed potatoes. Hot roll. Chocolate caramel mousse cake. Vegetable Moussaka with cheese, roasted pumpkin and cajun broccoli. Scrambled eggs with sausage, bacon, tomato, and mushrooms. Beef mixed with a creamy sauce, pasta, and mushrooms. Plus a salad to start with, with lettice and croutons (weird!) and a hunk of chocolate cake. Plus a cold roll, and one sliver of cheese with two Jacob's biscuits. Water on the tray, and a small chocolate. Quite decent actually, if you can get over the weird mixture. The salad has too much green stuff, and some oil to go over it would be nice, plus heating the roll would be good, but other than that it works. I love the creamy stuff with the pasta, its very good. 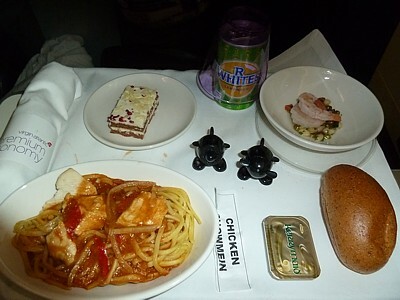 Chicken with pasta, sprinkled with strips of tomato, salad with two tomatos, a small cake, and a very small square chocolate. Plus a small carton of water. 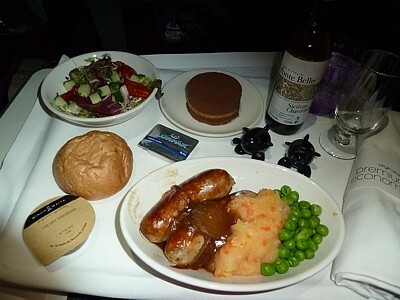 Virgin has a reputation for rubber food - and this meal proves that wheres theres smoke theres a Virgin Meal. Overcooked chicken with a consistency of Rubber, it's been happilly bounced around several flights before you get it. This is the US to UK version, so theres quite a decent salad, but it has cheese and biscuits which have processed cheese and low fat no taste biscuits. Theres a small low fat full of air slice of cheesecake as well. A chicken ceasar "sandwich" with lettice and chicken in a quadrant of a round loaf type thing. A sticky crumbly cake. And thats it. You do however get a fairly decent cup of coffee. 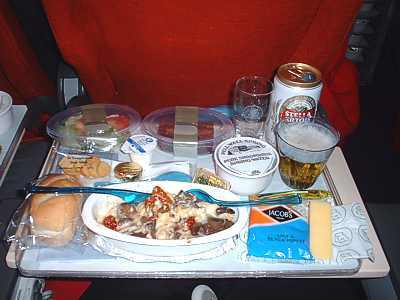 Not enough to make up for serving this as complimentary food, but it does make you worry about the economics of the airline. 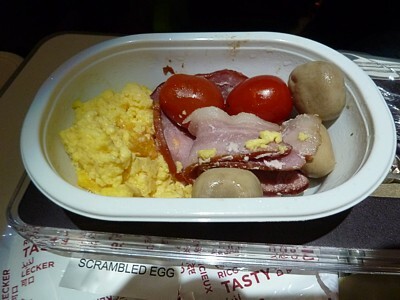 This is one of the worst transatlantic meals I've ever had. What do Virgin think they are doing? 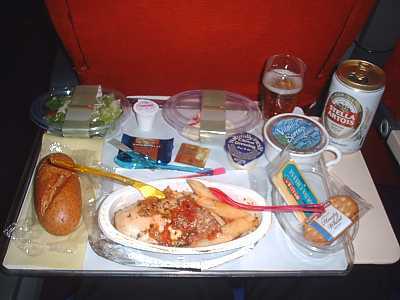 While tasty, it was little more than a snack, and is equivalent to what BA would have for their "All Day Deli" on domestic flights. Fruit salad with two grapes, four melons, and a semi-circle of orange. Plus a currant bun, and a small tub of orange juice. Just when you are thinking in the redeye A340 overnight flight from JFK to LHR couldn't get any worse, they wake you up at 4am for breakfast. 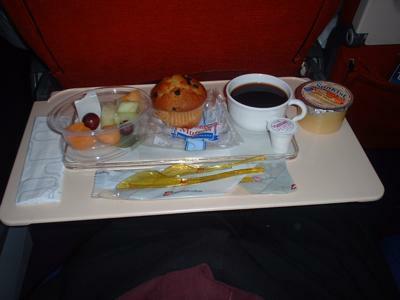 And what a breakfast - ice cold fruit salad, and a currant bun. I've seen people hurl this stuff away in the "early man" manic that sets in when you realise you could have gone BA and got a hot breakfast. Foul.